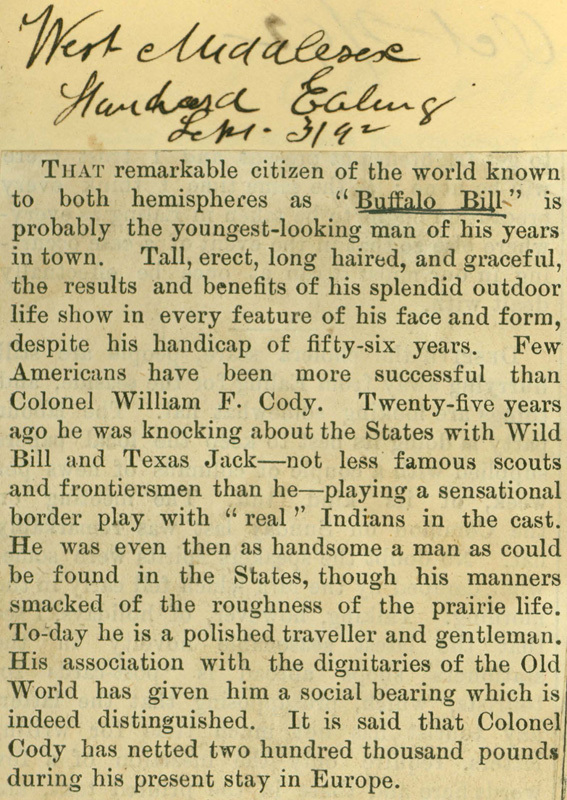 THAT remarkable citizen of the world known to both hemispheres as "Buffalo Bill" is probably the youngest-looking man of his years in town. 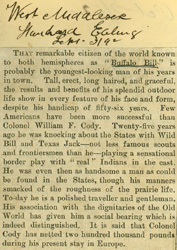 Tall, erect, long haired, and graceful, the results and benefits of his splendid outdoor life show in every feature of his face and form, despite his handicap of fifty-six years. Few Americans have been more successful than Colonel William F. Cody. Twenty-five years ago he was knocking about the States with Wild Bill and Texas Jack—not less famous scouts and frontiersmen than he—playing a sensational border play with "real " Indians in the cast. He was even then as handsome a man as could be found in the States, though his manners smacked of the roughness of the prairie life. To-day he is a polished traveller and gentleman. His association with the dignitaries of the Old World has given him a social bearing which is indeed distinguished. It is said that Colonel Cody has netted two hundred thousand pounds during his present stay in Europe.